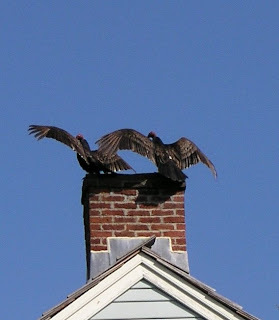 Two turkey vultures courtesy of Lost Bob. There are three things that mark the arrival of my personal spring, and it’s not the lemony daffodil, nor the robin and its morning worm. My spring came this week with the start of soccer, the return of the turkey vultures and today’s soup made from Saint Paddy’s Day leftovers. Soccer imposes a new routine, a maddening, demanding structure that wrings the patience out of the family chef and chauffeur. But first practice is mercifully free of the tedium to come. First practice is about possibilities: of soil and grass and colorful balls bouncing through the twilight as the players dream of a winning season. The turkey vulture really isn’t such an odd choice to herald spring at close inspection. Firstly, this big, ugly bird makes an annual migration to my neighborhood, spending its days drifting on the warm winds and its nights roosting in our tallest trees. Last week, I spotted my first vulture and today I counted thirteen thawing their stiff wings in the sun. Secondly, the turkey vulture is a scavenging bird of prey and carries the scientific name Cathartes aura, which means breezy cleanser, and isn’t that a perfect description of spring? 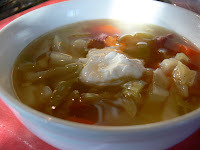 And then there is my spring soup, a light broth of simmered corned beef that holds the last slices of meat and chunks of potatoes and carrots, and is topped with a dollop of sour cream. The inspiration for this recipe came from The Mustard Seed, a tiny deli in Silver Springs, Nevada that served as the heart of its community until it closed. If you have the remains of Saint Patrick’s Day dinner in your refrigerator, give it a try. Broth from simmered corn beef or chicken stock. Left-over potatoes, carrots, cabbage and meat, cut into small chunks. Bring broth to simmer, add hominy, cooked vegetables and corned beef and heat thoroughly. Spoon into bowls and top with sour cream.